Well, the secret is finally out; after much thought, we have decided to tell our readers about one of our "regular" spots that is indeed hidden, and very, very good. Eastern Pier II is a place that this writer goes to as much as possible, especially during the warm days of the summer and fall. Why is Eastern Pier II such a good place to go on a warm day? Well, Eastern Pier II is one of Boston's few restaurants that has outdoor seating right on the water. In fact, its lengthy outdoor deck literally sits above Boston Harbor (you can see the water through the cracks in the floor from the tables). One interesting note: Boaters actually call in their order, then head over to the outdoor deck, where the waitstaff lowers their order to the boat via a bucket. The boaters then head off into the harbor to enjoy their food. Speaking of food, Eastern Pier II is no ordinary Chinese restaurant. Their Hong Kong seafood entrees are about as good as the best that Chinatown has to offer. Some of the seafood dishes they have include grey sole in wine sauce, sea conch in black bean sauce, salt and pepper squid, and many more interesting dishes. For those who are a bit less adventurous, Eastern Pier II also has excellent Szechuan dishes (as well as more familiar Hong Kong dishes), including kun pao chicken (one of our favorites there), sizzling beef in black bean sauce (delicious spices), and a medium-hot curry noodle with pork and shrimp (a definite favorite of this writer). 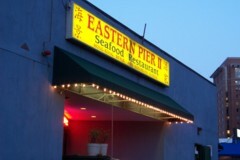 Eastern Pier II also has excellent soups, including a terrific hot and sour soup as well as a top-quality wonton soup. Aside from its scenic waterfront location and its excellent food, Eastern Pier II is a great place to go simply because it has easy parking and it is almost never full. In fact, it is not uncommon to get an outdoor table on a Saturday night at 7:00. Try to get THAT at any of the other restaurants along Boston Harbor. It is surprising that Eastern Pier II has not been discovered by more people. We are a little sad to let the secret out about this excellent Chinese restaurant, but Eastern Pier II is too good to keep secret any longer. Copyright © 2005-2007, Boston's Hidden Restaurants (www.hiddenboston.com).